Justice For Kennedy: Did Trump commit Treason? Okay some 20,000 emails were released some time ago, a few months back. Debbie Wassermann Schultz was shown in a bad light, that as the DNC chair she used everything she had control over as the DNC chair to help Hillary Clinton and block Bernie Sanders, something the Sanders campaign has complained about for a long time. Yesterday a lot more of it came up. So, step one, she’s not going to speak at the convention. That wasn’t good enough. Step number two, was the apology. Still not good enough. And then she resigns as DNC chair. So, Donna Brazile is promoted to DNC. She was the campaign manager for Al Gore. She didn’t do a great job there. She’s been a commentator on CNN. Notice the way a problem was handled between the Democrats vs. the Republicans? There was no denial, no push back, just a problem, we got to deal with it, and bam, she’s out. They should have dealt with it sooner. They had to fire her. Der Donald invents people to fall on the sword. The female staffer he said was responsible for how Michelle Obama’s speech wound up in Malania’s speech, that staffer doesn’t exist. Bernie took the high rode about the whole thing. When the emails were released Bernie had already lost. Nothing was ever done at DNC. The RNC chair, however, did the same thing to Trump. The only difference is Trump got the RNC nomination despite this. Debbie Wassermann Schultz was Hillary’s campaign manager in 2008. The Bernie-ites never understood the problem. They were surprised over and over again as to what the voting procedures were in state after state. Independents thought they could vote in a Democratic primary in New York and were surprised they could not. I don’t think this was uniquely true for New York’s primary. Bernie could give great speeches but he had no experienced political infrastructure helping him. perp walk right into the police paddy wagon. 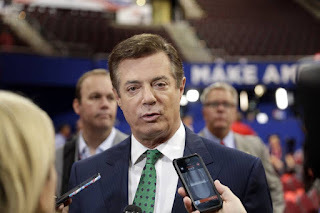 Paul J. Manafort, Trump’s new campaign manager, his last big job was working in the Ukraine where an evil dictator, Yanukovych had been ousted by a democracy was trying to make a come back. Manafort got the dictator his job back. 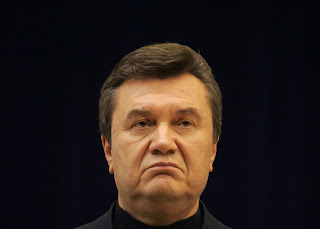 Then the people had a coup to oust him again. You might recall this competition in the Ukraine for power. 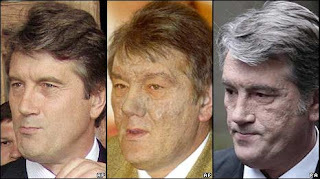 Pro-Western opposition leader Viktor Yuschenko was poisoned by dioxin during the campaign which aside from nearly killing him severely damaged his skin which was most notably on his face. His face still bears damage from this, let’s call it what it was, an assassination attempt. Recently, George Will has opined that the reason we're not seeing Trump's tax returns is because it would reveal a connection to Russian oligarchs. Now the Right-wingers will not allow a discussion of how these emails came to light. That issue is verboten! They insist you stay focused on their talking point, which is the content of the emails. Never you mind how they were made public. The claim that Russia hacked Hillary's email was reported upon by the BBC at least as far back as Oct of 2015. So, no, it's not a new defense created within the last few days to draw attention away from the email content. The point has to be made, again and again, that although there are stupid suggestion for actions to take against Sanders there is no proof any such thing was actually done, for example the suggestion to attack Sanders based on his religion never happened. Salon.com has an article which explains why this is much worse than Watergate.